I live in Des Moines, where local soccer means Des Moines Menace….the 2014 Regular Season National Champion Des Moines Menace that is. I have soccer friends in Iowa who are really into MLS who drive to Kansas City or Chicago to watch games. The phrase “soccer friends in Iowa” is a new thing for me. It’s only in the last five or six years I’ve had a group that inspired me to do more with MLS than catch a game when it was convenient. Last year was the first year I knew what the Supporters Shield was (this year I’m wishing it was awarded in the PDL), and with the 2013 MLS All Star Game in Kansas City, it was the first year I got to watch friends travel to the ASG. Major League Soccer is slowly sucking me in. 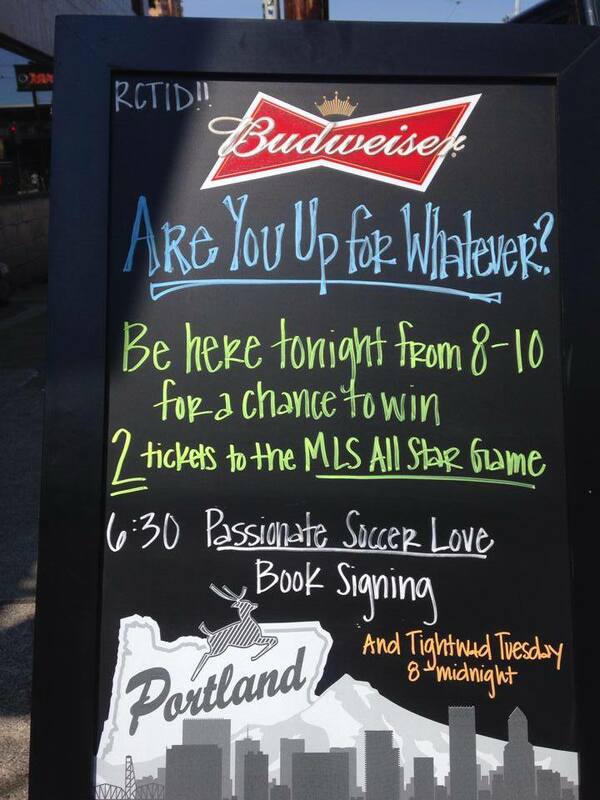 Exhibit A: I just arrived in Portland for my first MLS All Star Game. My morning has already been pretty cool (despite waking up at 2:15 AM Portland time). Once I made my connection in Chicago I was on a plane with a DC United fan and several Chicago Fire supporters (and the general counsel for the Fire, who looked like a business traveler until he unbuttoned his dress shirt to reveal a retro Chicago Fire navy jersey). It cracked me up, thinking about soccer fans from all over the country converging on Portland, each of us hitting our on moment when it’s OK to take the professional clothes off and reveal our true soccer loving selves. Personally, I left the house in my Portland Timbers jersey, although I don’t think it was noted by any neighbors at 4:30 AM. I’m stoked to unlock another level of MLS Soccer this week and check out the MLS ASG festivities, but I really hope I get to meet some MLS fans from around the US so I can hear your stories about what life is like in full time MLS supporting. I’m doing a book signing tonight at the Cheerful Bullpen at 6:30 PM PT. I’ll have my book, Passionate Soccer Love, for sale and I’ll sign them and even do a reading if asked (maybe from one of the MLS chapters), but really I hope you’ll come out and help me learn more about the world of MLS: your supporter clubs, your songs, your rivalries…and help me continue to get to know the club side of US Soccer.